In the months following the failure of General Montgomery and General Arnold to take Quebec, the northern army in Canada got little attention. The focus remained on Boston. After the British Evacuation of Boston in March, with officers bickering in weeks of indecision to send us a new leader, Washington finally got Congress’ approval to send a new leader for the northern army in Canada. General John Thomas was from Massachusetts. Now in his early 50’s, he had military experience in both King George’s War as well as the French and Indian War. 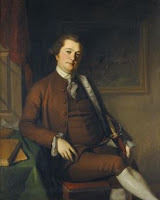 He had played a leading role in helping the British captured Montreal from the French in 1760. He was an early patriot and part of the militia army that besieged Boston. The Massachusetts Provincial Congress made him a lieutenant general, just below Artemas Ward. When the Continental Army formed in June 1775, Thomas received a commission as a brigadier general. He almost didn’t take it, as he considered it a demotion. But Congress did not want to have two major generals from Massachusetts. General Washington finally convinced him to take the job, and sweetened the deal by making him the most senior brigadier general. Thomas served as field commander of the army on Dorchester Heights, the occupation of which finally convinced the British to evacuate Boston. 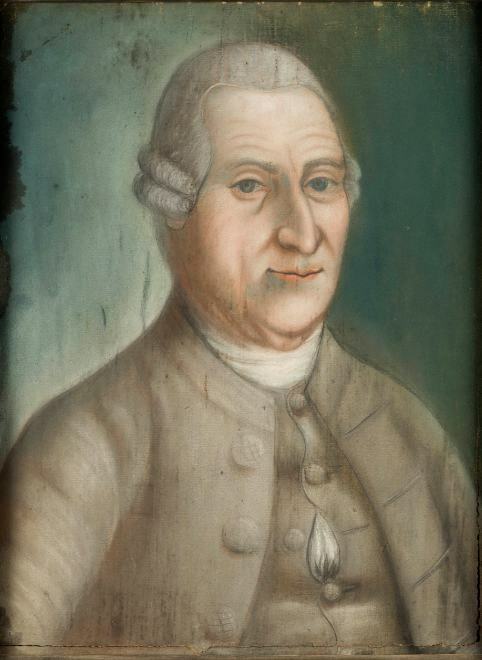 Following that success, Congress promoted Thomas to major general and gave him his first independent command, taking charge of the Continental Army in Canada. Congress had told Thomas that his command in Canada would be over 4000 men. When he finally arrived in late April, he found he had nothing close to that. Although the Continentals had transferred more soldiers to Canada during the winter, large numbers of them had died of smallpox. Many more were sick with smallpox or other diseases and unfit for duty. He found his total force to be less than 2000 men, and only half of them fit for duty. Even worse, many of the enlistments ended in April, and the men had no interest in remaining under any terms. Some enlistments had already ended but officers had refused to release the men, making morale even worse. He also found that most of the officers were fighting among themselves. The soldiers did not have sufficient food or clothing. The locals were becoming increasingly hostile to the Continentals, and the British would probably be sending a relief fleets to arrive in the next few weeks. Thomas, however, was a capable general and not one to back down from a challenge. He set to work reorganizing his army. One of the first things he did was transfer General Wooster back to Montreal. Apparently, Thomas did not have a good opinion of Wooster either. Thomas was also effective because he was willing to mix with the soldiers and share their burdens. He mixed with the soldiers so much, that within weeks of his arrival, he contracted smallpox, which sadly would kill him by June. But in early May, Thomas still hoped to pull off a stunt that would let him break the Siege of Quebec before the British relief fleet arrived. 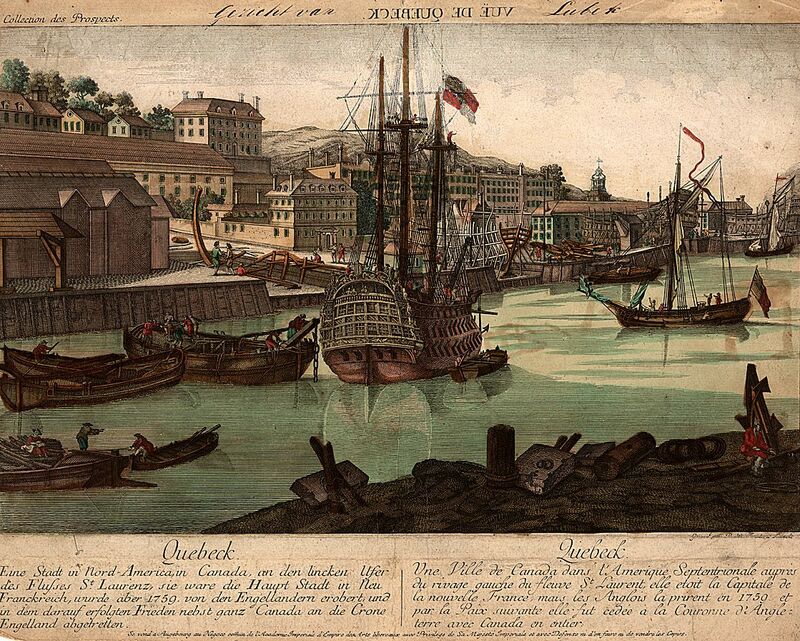 On the night of May 3rd, sentries in Quebec saw the first relief ship approaching the city. The British had arranged a secret signal and counter signal to make sure they could identify the fleets. The defenders in Quebec hoisted their flag and fired five cannon, to indicate they were still in control of the city. But the ship never gave the counter signal. With no signal, the defenders began firing on the ship, only to see a small crew abandon the ship and row away in a boat. Thomas, taking Arnold’s advice, had attempted to use the ship as a fire ship. The plan was to get it as close to the city as possible, set it on fire, and hope that the burning ship would set the city of Quebec on fire. But the defenders did not let the boat get close enough. It soon floated downstream and burned to the water line, doing no damage. Two days later, on May 5, the first real relief fleet would arrive and finally break the Siege of Quebec. Upon the ship’s arrival, General Guy Carleton finally took 900 Quebec defenders outside the city walls and dared the patriots to battle on open field. The few hundred Continentals still around Quebec fled without even attempting to mount a token challenge. They abandoned the artillery placements that Arnold had constructed in the months prior and moved up river. A few days later, General Thomas held a council of war with his officers. Thomas favored taking a stand a Deschambault, a few miles upriver from Quebec. The patriots still were not sure how large the British relief fleet would be. Most of the fleet had not yet arrived. General Wooster also favored taking a stand. But almost all the other officers in attendance voted to retreat further up river to Sorel, where the St. Lawrence River met with the Richelieu River. That was the patriot line of retreat back to Lake Champlain if the British attacked in force. Thomas stayed in Deschambault in case the promised artillery arrived soon. He could make a stand there, and at least command a holding action to delay any British assault. Meanwhile Arnold, still back in Montreal, wanted to get closer to the front and stop what he saw as a precipitous retreat. He moved forward to Sorel where most of the patriots from Quebec were going. The only good news for the patriots at this time was that General William Thompson, newly appointed brigadier general, arrived in Canada with 2000 Continental reinforcements. While the army now had men, it had no food for them, nor much ammunition. Even worse, smallpox quickly began to ravage the ranks of the reinforcements, just as it had the men already serving in theater. Arnold was hedging his bets at this point. While he was trying to move as many forces as possible forward to confront an expected British advance, he also maintained posts further south to make sure the army had an open line of retreat, should rumors of overwhelming numbers of British reinforcements prove accurate. With Arnold in Sorel, Colonel Moses Hazen commanded Montreal. Upon hearing rumors that British garrisons further west had mobilized an attack force of Indians and French volunteers, Hazen dispatched Colonel Timothy Bedel and 400 soldiers to build a stockade at the Cedars. 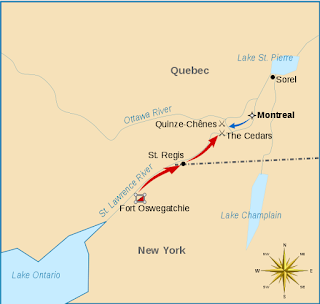 The Cedars was located about 30 miles upriver and to the west of Montreal. This would provide a defense against any surprise attack coming from further upriver against Montreal. Bedel’s regiment began work on a stockade, but Bedel himself did not stay on site. Instead, he left is second in command, Colonel Isaac Butterfield in command while Bedel left to meet with the local Caughnawaga Indian tribe. He wanted to make sure this local tribe would not cooperate with the British in any attack. Meanwhile the rumors of an attack force proved true. A French Canadian named Claude de Lorimier, who served as a British Indian agent left Montreal to meet with Iroquois at Fort Oswegatchie, a small outpost in western New York still occupied by a small British regular garrison. Lorimier organized about 200 Iroquois, along with about 40 regulars and 10 local French Canadians, to attack the patriot forces at Montreal. British Captain George Forster commanded the small brigade. On May 15, Colonel Bedel received word that there was an British led Indian force headed to attack his regiment at the Cedars. Rather than return to his regiment and take command, or even warn them, Bedel ran straight to Montreal to inform the command and ask for reinforcements. Whether this was outright cowardice or an error in judgment, that would be debated later. For now Bedel’s troops would have to face the enemy without their leader. Bedel reported that 150 regulars and 500 Indians were getting ready to attack the force at the Cedars. In fact, the total force was only around 250 total, including only 40 regulars. Officials in Montreal argued over sending a relief force. Apparently the two Congressional delegates still in Montreal tried to issue orders. This led to a fight over authority with the officers in command. As a result, no relief force left for two days when Major Henry Sherburne took 140 Continental soldiers to support the garrison at the Cedars. Colonel Bedel started off with the relief column, but then decided he was “too sick” to march and returned to Montreal. 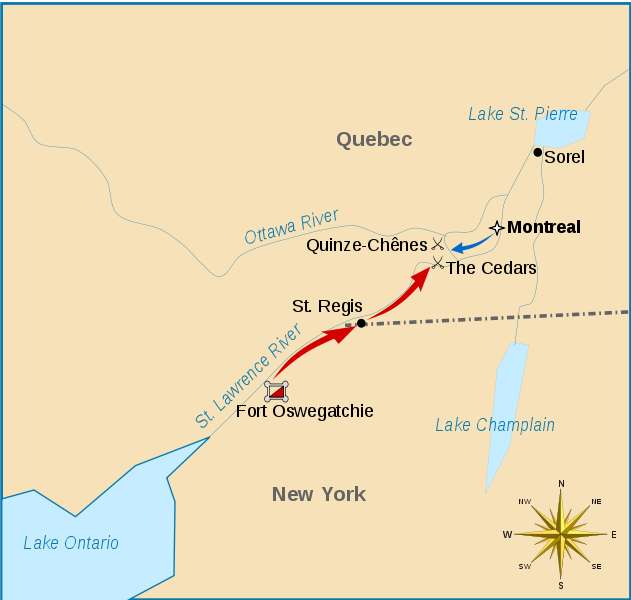 On May 18, the day after Sherburne’s relief force left Montreal, regulars and Iroquois surrounded the stockade at the Cedars. The defenders outnumbered the attackers and also had two small field cannon to defend their position. The men had sufficient food and supplies to defend themselves for days. The British commander, Captain Forster decided to bluff. Implying that he had a much larger force, he called on the force inside the stockade to surrender immediately, or suffer the full ravages of the attacking Indians. Almost immediately Colonel Butterfield seemed ready to surrender, but only if the defenders could leave with their arms. Forster would not agree to the terms and began his attack on the stockade. Over the course of the day and night, the defenders easily held their position, only one man suffering a minor shoulder wound. By the next morning though, Colonel Butterfield wanted to surrender. His junior officers thought this was crazy and debated a mutiny to put a more capable officer in command of the defense. But before they could do so, Butterfield called for surrender, apparently unnerved at the prospect of being tortured and murdered by Indians. Forster’s force took the entire garrison prisoner and captured all of their arms, ammunition, food, and supplies. As the men marched out of the stockade, the Indians stripped them of all valuables, went through their pockets, and took their personal possessions as prizes of war. Sherburne’s relief column, which had dwindled from 140 to about 100 men due to illness and posting guards to cover a potential retreat and guard supplies, approached the Cedars on May 19. Upon hearing the garrison had already surrendered, Sherburne pulled back across the river and waited until the next morning to approach. When his column did march, the Indians ambushed them in open ground. The battle raged for about an hour, leading to 28 Continentals killed, and an unknown but apparently much smaller number of Indians killed or wounded. Sherburne surrendered unconditionally. The Indians took this to mean they could strip their captors of all their possessions, including their clothes. There were no regulars with the party, but the Indian Agent Lorimier was with them and had to go to great lengths to keep the Indians from massacring the prisoners. Later, some accused the Indians of tomahawking and scalping several prisoners, though whether this really happened is debatable. It is possible that the Indians just scalped some of the dead after the battle. Lorimier and the Indians marched the naked prisoners back to a church where the prisoners from the Cedars were being held. At this point, the Indians decided it was unfair that the Cedars prisoners got to keep their clothes while the relief column did not. They proceeded to strip the rest of the prisoners of their clothes as well. Prisoners had to sleep in open fields with no food or clothing, and not allowed fires nor given any food. General Arnold soon received word of the fall of the Cedars and Sherburne’s relief column. He feared the British and Indian Brigade would soon descend upon Montreal and capture the city. Arnold ran back to Montreal where he grabbed every soldier he could find, a total of about 150 men. As he marched his men toward the Cedars, he collected more soldiers from various outposts, so that is force totaled around 450 by the time he got near the enemy. On the evening of May 24, Arnold’s cobbled-together regiment heard the drums of the enemy encampment. Arnold immediately called for a nighttime surprise raid that would scatter the enemy and recapture their comrades. But his men refused. They were not a single unit, but were a collection of small groups of soldiers from various places who had never fought together. They did not want to fight Indians at night and in open fields. Frustrated, Arnold waited until morning, only to find that Captain Forster and his prisoners had retreated during the night. Forster was in a difficult situation. His original force of 250 men was falling as some of the Indians began to leave with their booty. He had nearly 500 prisoners and was facing Arnold’s attacking force, which some intelligence had exaggerated was as much as 2500 men. Forster forced the prisoners to march through swamps and across streams. At least one drowned and two others were killed after being unable to keep up. Arnold finally caught up with Forster, who was moving the prisoners from an island to the opposite bank of the river. Arnold sent a demand that Forster surrender his prisoners. Instead, Forster sent a reply that if Arnold attacked he would allow the Indians to massacre all the prisoners. Once Forster departed the island, Arnold moved his forces there, recapturing five prisoners who had been left behind. Forster used the two cannon he had captured at the Cedars to keep Arnold from attempting a landing on the far bank in face of the enemy. Forster, realizing he could not fight off Arnold for long, and retain control of all his prisoners, reached a deal with the captured commanders, Butterfield and Sherburne, to release all the prisoners on the promise that they would be exchanged for captured British soldiers of equal rank. Arnold refused the terms because they held that American prisoners had to take an oath not to take up arms again, while the returned British prisoners would be under no such restriction. Forster removed the condition of the oath to get an agreement and released his prisoners. The Indians kept ten of the prisoners to be adopted into their tribes. Later, the British ransomed and returned eight of the men. The other two apparently opted to remain living in the tribes that adopted them. Forster took custody of four officers as hostages to ensure the Americans would release their prisoners as promised. Congress, however, decided the prisoner exchange was unacceptable. It refused to release any prisoners, even though the Americans had already been returned. They did this over the objections of Washington and other officers, who pointed out, correctly, that it would make future prisoner exchanges almost impossible if one side would not keep its word. But since it was much harder to replace captured British regulars than Continentals, refusing exchanges, probably worked out better for the patriots. Even so, it meant thousands of prisoners would suffer and die under miserable prison conditions. Eventually, the British returned the four officers that had been held hostage. I have not found out what terms or circumstances led to to their release, or exactly when that happened. But they, like many other officers felt betrayed by Congress’ refusal to accept the terms for the negotiated prisoner exchange. Given the combat conditions of the time, the courts martial had to be put off for several months. After all, the British were still in the process of invading from Canada. For the moment, everyone had to fight. The hearings would have to come later. In August, a court martial found found Bedel guilty of quitting his post when he ran back to Montreal rather than to his regiment when he heard of the enemy’s approach. Bedel blamed his behavior on fuzzy thinking due to his illness. He was suffering from a mild attack of smallpox after being inoculated. He claimed this affected his admittedly poor judgment. Even so, the court martial ordered him dismissed from the army, though he was permitted to rejoin the army a little over a year later. Butterfield, who had surrendered the Cedars without much of a fight to an inferior force faced court martial for cowardice. The court found him guilty and dismissed him from the army permanently. The one other outcome of the incident was that Arnold, surprise surprise, made a few more enemies. Before returning to Montreal, Arnold ordered Colonel John Philip De Haas to burn a local Indian village, possibly for its cooperation with the marauders. After Arnold left, De Haas decided not to burn the village, as it might provoke a new Indian uprising. When Arnold learned about the refusal to obey his direct order, he was outraged. De Haas would go on to become a general, but remained on Arnold’s bad side for the remainder of the war. Colonel Moses Hazen had also served under Arnold during the attempted rescue of the Cedars garrison. Hazen had been among the officers who refused to back Arnold’s attempts to attack the enemy aggressively. During the arguments, the men exchanged insults and became lifelong enemies. Arnold, who had written several positive comments about Hazen up until this point, now believed the man was not fit for command. Although Hazen would also become a Continental general, Arnold wanted nothing more to do with him, and apparently the feeling was mutual. The battle of the Cedars, as it came to be known, was another stain on the reputation of the northern army. It would not be the last defeat as the British pushed the patriots out of Canada and reclaimed that territory for the King. Next Week: I’m going to step back from the battles raging around the continent to take a look at the state constitution movement that is easing the colonies into independent states. You can support the American Revolution Podcast as a Patreon subscriber. This is an option for people who want to make monthly pledges. Patreon support will give you access to Podcast extras and help make the podcast a sustainable project. Thanks again! Third Series, Vol. 84 (1972), pp. 44-52 http://www.jstor.org/stable/25080728 (free to read online, requires registration). Codman, John Arnold’s Expedition To Quebec, New York, MacMillan Co., 1901. Coffin, Charles The Life and Services of Major General John Thomas, New York: Egbert, Hovey & King, 1844. 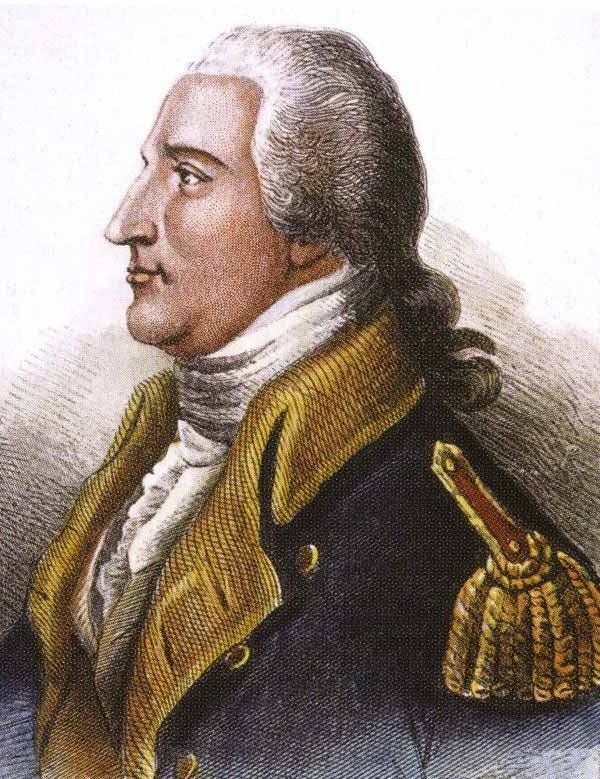 Hill, George Benedict Arnold: A Biography, Boston: E.O. Libby & Co. 1858. Kingsford, William The History of Canada, Vol. 6, Toronto: Roswell & Hutchinson, 1887. Smith, Justin Our Struggle for the Fourteenth Colony: Canada, and the American Revolution, Vol. 2, New York: G.P. Putnam's Sons, 1907. Winsor, Justin (ed) Arnold's expedition against Quebec. 1775-1776: The Diary of Ebenezer Wild, Cambridge: John Wilson & Son, 1886. Withington, Lothrop (ed) Caleb Haskell's diary. May 5, 1775-May 30, 1776. A revolutionary soldier's record before Boston and with Arnold's Quebec expedition, Newburyport: W.H. Huse, 1881. 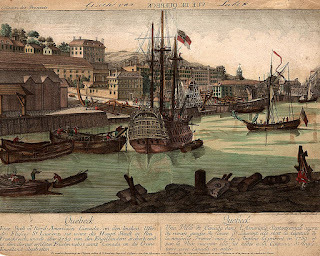 Würtele, Fred C. Blockade of Quebec in 1775-1776 by the American revolutionists (les Bastonnais) Vol 1) Quebec: Daily Telegraph Job Printing House, 1905. Würtele, Fred C. Blockade of Quebec in 1775-1776 by the American revolutionists (les Bastonnais) Vol 2) Quebec: Daily Telegraph Job Printing House, 1906. Anderson, Mark The Battle for the Fourteenth Colony: America’s War of Liberation in Canada, 1774–1776, University Press of New England, 2013. Cubbison, Douglas R. The American Northern Theater Army in 1776, Jefferson, NC: Macfarland & Co. 2010. Everest, Allan S. Moses Hazen and the Canadian Refugees in the American Revolution. Syracuse University Press, 1976. Also available as free download at: www.jstor.org/stable/j.ctv64h762 (book recommendation of the week). Hatch, Robert Thrust for Canada, New York: Houghton-Mifflin, 1979. Fleming, Thomas 1776: Year of Illusions, New York: W.W. Norton & Co., 1975. Martin, James Benedict Arnold: Revolutionary Hero, New York: NYU Press, 1997. Randall, Willard Benedict Arnold: Patriot and Traitor, William Morrow & Co. 1990. * This site is a registered Amazon Associate. Please help support this site by purchasing any of these books, or any other Amazon product, via the links on this site. If you start by clicking on a book link above and then browse to buy something completely different on Amazon, American Revolution Podcast will get credit for your purchase. American Revolution Podcast is 100% free and completely ad free. If you can chip in to help defray my costs, I'd appreciate whatever you can give. But do not feel obligated. If you are not in a position to help, please continue to enjoy at no cost.